Order my limited edition silky scarf in Fall 2016 scarf featuring my classic animal patches on polka dots and stripes. Wear it or hang it on the wall as art. $75 for a 35″ poly crepe de chine square scarf. Get a pocket handkerchief to add color to your fall suit. This sweet pocket square features bull dog Coco from Cranston for $35 or two for $50. Custom pet portraits are available for an additional fee. See etsy shop for details. I have been experimenting with Spoonflower to print these silky scarves for the 2016 show season. Happy New Year! This is Logan the Boston terrier from Boston, MA. Holiday Sales 2015: Mark your calendars! I will be at the Providence Flea at Hope High school in Providence for two Sundays. See something you like but can’t visit Providence? Browse my Dino: Diane Hoffman Textiles Facebook page feed, visit my Etsy shop for a classic item or send me an email to custom order. Words and thought process from Diane Hoffman, owner of Diane Hoffman Textile Shop on Artists’ Row. But make no mistake about it, she is in control of that entire creative process. Design, printing, and sewing. 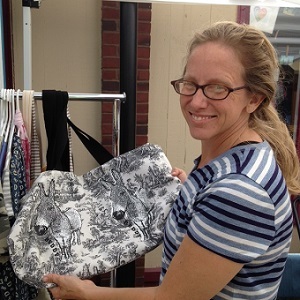 Diane Hoffman Textiles is a one-woman textile business. All products are hand printed and made by hand with locally sourced and recycled material. Silkscreen and stamp printed woven (cotton and recycled feedbags) materials are sewn into tote bags, clutches and chic duffels. — many with interior designs! It’s that extra step which makes her work special and not easily comparable to items at department stores. She’s been here for three months focusing on hand printed textiles and knits, featuring rescued pets and farm animals from New England. She tries to bring past and present together. She shows us a toile, (Toile de jouy is a fabric originated in France in the 1760s. The original patterns usually depicted pastoral scenes). It has a donkey within the pattern but she added a larger version donkey to bring it to the forefront as part of her creative process to find something new. 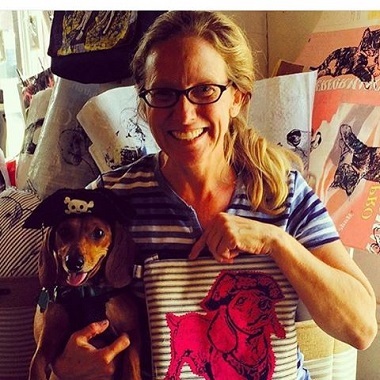 Her current project on t-shirts and bags is doing road dogs and cats. If nothing else, Salem has plenty of cats, and you can’t go a day without crossing paths with several people walking their dogs. Also in keeping with her thoughts about doing “things that seem a little uncomfortable to find something new,” she holds community print demo sessions on Thurs 4-6pm. “We try to get people to come & do artwork. And I think the work they do is quite good.” But the materials are the interesting element. An upcoming session will use not paint but powdered graphite (which has an oily feel) and stencils. A good portion of it provided by Diane. Silk screens to put ink on canvas, fabrics with a vintage feel, bold images on material like the type used for hats of old-time train engineers. These and more are what you’ll find at Diane Hoffman Textiles, open daily 11am-6pm (except Monday) and open until 7pm on Thursday. For more info, go to her website. Commission your very own Pet Portrait. This is Charlie from Salem. Message me for details.